CORONELLI - Planisfero Settentrionale Corretto, et Accreciuto . . .(together with) Planisfero Meridionale, Corretto, et Accrescuito . . .
CORONELLI,P. - Planisfero Settentrionale Corretto, et Accreciuto . . .(together with) Planisfero Meridionale, Corretto, et Accrescuito . . .
Planisfero Settentrionale Corretto, et Accreciuto . . .(together with) Planisfero Meridionale, Corretto, et Accrescuito . . . - CORONELLI,P. Title : Planisfero Settentrionale Corretto, et Accreciuto . . .(together with) Planisfero Meridionale, Corretto, et Accrescuito . . .. Size : 18.3 x 24.0 inches. / 46.5 x 61.0 cm. 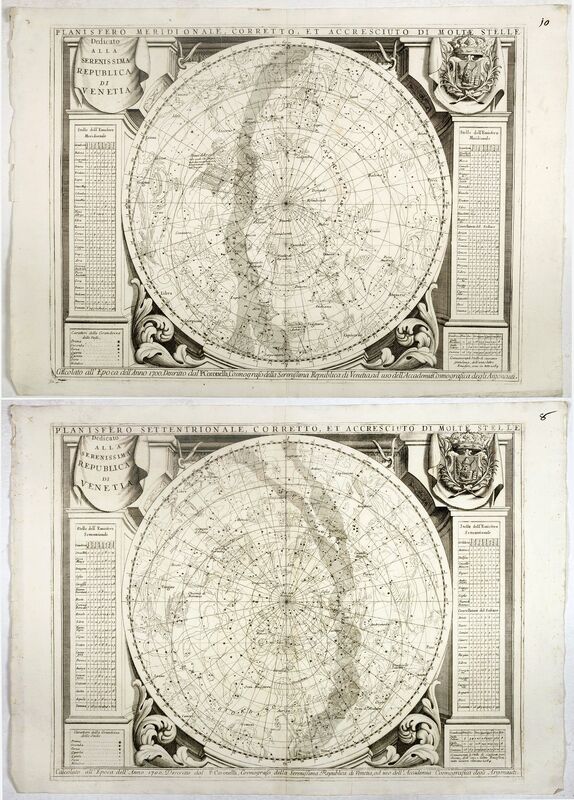 Description :Set of two decorative celestial charts of the Northern skies and southern skies. From Coronelli's "Corso Geographico". The constellations and the brightest stars are represented in classical Greek fashion, as heroes and heroines, animals, and other familiar objects. The stars are differentiated in six different degrees of magnitude. The stars were placed using the work of astronomers, including those of Hevelius, Halley, Anthelme and Bayer. The scale of magnitudes, the list of constellations with their detailed number of stars, divided by magnitude, are placed at the left and right sides of the planisphere. The non-Ptolemaic constellations are represented by Columba, The Cross, Licorno, Romboide and the twelve reported at the end of the 1500' by travellers as Keyser and Houtman and submitted by Bayer in his Uranometria of 1603. Condition : In very fine condition. Size of each sheet 465 x 610mm. Dark impressions.